International trends highlight the confluence of economics, politics and legal considerations in the health policy process. 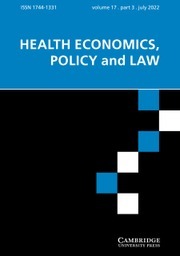 Health Economics, Policy and Law serves as a forum for scholarship on health and social care policy issues from these perspectives, and is of use to academics, policy makers and practitioners. HEPL is international in scope and publishes both theoretical and applied work. Considerable emphasis is placed on rigorous conceptual development and analysis, and on the presentation of empirical evidence that is relevant to the policy process. A key output of HEPL is original research articles, but the editor also encourages readers to propose topics for editorials, review articles and debate essays.